Dexmet Corporation in Wallingford, Connecticut. 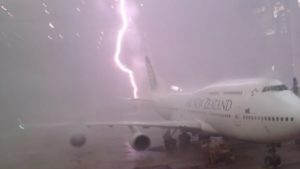 Since each commercial aircraft is struck by lightning about once a year, on average, this is extremely important from a safety standpoint. This technology has been in use for about 20 years, but is now coming into its own with the very extensive use of composites in new technology aircraft such as the Boeing 787, Airbus A350XWB, Bombardier CSeries and Embraer E-Jets. Needless to say, the market for Dexmet’s lightning strike protection is rapidly increasing as the next generation of aircraft are just entering or about to enter service. The photos below show what happens to a test panel of composite materials when zapped by the equivalent of a lightning strike in a laboratory. The first photo shows the impact of a lightning strike without the protective material, which has blow a hole clear through the panel. We wouldn’t want to imagine the effects of a strike on a composite fuselage, and the potential for explosive decompression. The second panel shows the results of a test at the same voltage on composites with the expanded metal mesh embedded in the composites. Damage is limited to a scorched outer surface layer that can be readily repaired. With the material in place, lightning strikes on composite aircraft can be absorbed and dissipated in the same manner as for an aluminum surface. Dexmet Corporation routinely works with airframe manufacturers and composites manufacturers to develop custom solutions for aviation applications, and to optimize the size and weight of the material to provide an appropriate level of protection for each area of the aircraft. As a result, the mesh over a fuel tank is typically a bit thicker than for a panel on a tail surface, and may be made of different materials, including copper and aluminum alloys. I had an opportunity to interview the President of Dexmet, Mr. Bob Bochman to talk about their expanded material and how it works. I hope you find it as fascinating as I did. Here is the video, for the interview.